Hello, my name is Hiromi. Our salon is located in a hotel right near Nagoya Castle. I see many tourists visiting Nagoya Castle, and of course many visitors from foreign countries. I want to offer my traditional kimonos and professional salon techniques to you, to make your experience even more memorable. Please come visit my salon! Dress Up in a Traditional Kimono and Walk Around Nagoya! Hiromi-san and company are very friendly and accommodating hosts. They did a good job on our hairstyles. 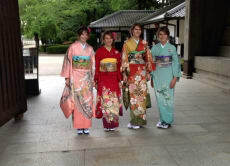 Our kimonos also were very pretty and looked very nice for taking photos. We loved it very much! Arigatou!!! !